Harmful Steroids are being used in Bangladesh for cattle fattening. The traders are cutting long process short with the help of harmful drugs .The safe methods are ignored for slow results, 63.7% farmers are using drugs for cattle fattening. If consumed such meat may cause cancer and kidney disease. Fattened beef causes infertility in women. Violating law and driven by motive for quick money, traders and farmers are using excessive harmful drugs to fatten cattle for the Eid market, posing serious threat to public health. This process has enormous health impact on cattle and it could kill the cattle as well. Cattle traders with the help of veterinary quacks and dishonest livestock officers have been using cheap steroid drugs like Oradexon, Betamethasone,Decason, Dexamithson , Paractin, Steron and Presdnisolon . The use of steroids and harmful drugs for fattening cattle was prohibited by the Fisheries and Livestock Act 2010. Among the farmer, 70.6% use steroid as a growth hormone. The number of slaughtered cattle including cows, buffaloes, goats and sheep had increased significantly in the recent past including 65.39 lakh slaughtered at the time of Eidul Azha in 2013 as against 37.96 lakh in 2009 . A large number of farmers are involved in cattle fattening just before 3-4 months of Eidul Azha, when they sell the animals for profitable margins. Cattle fattening has become an important business in Bangladesh. The farmers generally use rice straw, green grass, wheat and rice bran, molasses pulse bran ,pumpkin ,carrot, banana, vegetable by products, oil cake ,etc for cattle fattening. In some cases straw is treated with urea and molasses. Urea, molasses, straw treatments in beef cattle resulted higher body weight. Farmers generally use three years old cattle for beef fattening. 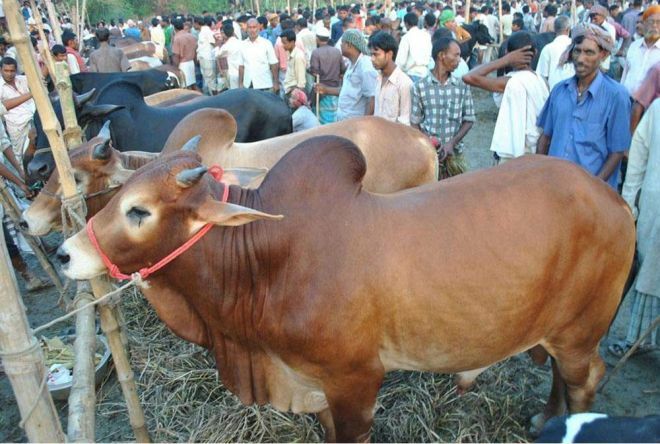 In northern districts including, Dinajpur, Nilphamari, Gaibandha, Kurigram, Lalmonirhat, Thakurgaon and Panchagarh farmers fatten varieties of oxen and bulls like cross breed , Pabna breed, Australian Friesian breed and Pakistani Shahiwal breed. Some farmers push steroid and hormone to the cattle’s body and feed them much urea to make them grow fast. Steroid cause accumulation of fluid in cattle and make them look fatter. These chemicals attack their immune system and make them vulnerable to diseases. Artificially fattened cattle look bulky but their life span shortens. People consuming meat of such cattle may get kidney problem, liver failure, gastric ulcer, diabetes, pancreas disease, high blood pressure and skin disease (the Daily Star, September 30, 2014). The high court on Monday, September 29, 2014 directed the Government to form a seven member committee entrusting it to prepare the guidelines to check marketing of cattle fattened with drugs. It is worth mentioning in this context that the Fisheries and Livestock Act 2010 prohibits the use of steroids and other harmful cattle fattening drugs (the New Age, September 30, 2014). There is a pressing need for implementing the Fisheries and Livestock Act 2010 prohibiting the use of poisonous chemicals for cattle fattening. Moreover, there is no alternative to creation of public awareness against the use of harmful chemicals for cattle fattening.